A Simple Linear regression is a linear regression with only one predictor variable (X). Correlation demonstrates the relationship between two variables whereas a simple regression provides an equation which is used to predict scores on an outcome variable (Y). The intercept is the point in the Y axis when X is null. And the slope tells that for each X units (1 on the X scale), Y increases of the slope value. The intercept and the slope are also known as coefficients or parameters. The distribution of the error (residual) is normally distributed. The values of the regression coefficients are estimated such that the regression model yields optimal predictions. The regression coefficient is what we observed. This idea is called the Ordinary Least Squares estimation. to minimize the Residual sum of Squares (RSS). The standard deviation division is needed in order to take into account the scale and variability of X and Y. The coefficient are standardized to be able to compare them. For instance, in a multiple regression. The unstandardized coefficient are linked to the scale of each predictor and therefore can not be compared. The standard error is the standard deviation calculated on the error distribution. (assuming that it's normal). (under a scenario where we got repeated samples ie repeated training set). If we calculate 100 confidence intervals on 100 sample data set, 95% of the time, they will contain the true value. Visually, if we can't get a flat regression line (Slope = 0) in confidence interval region (the shadowed one), it means that it's a significant effect. or larger. In a linear regression, when the p value is less than 0.5 we will reject the null hypothesis. With a p-value of for instance, 10 to the minus 4, the chance of seeing this data, under the assumption that the null hypothesis (There's no effect, ie no relationship, ie the slope is null ) is less than the p-value (10 to the minus 4). In this case, it's very unlikely to have seen this data. It's possible, but very unlikely under the assumption that the predictor X has no effect on the outcome Y. The conclusion, therefore, will be that the predictor X has an effect on the outcome Y. 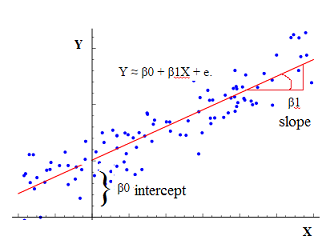 For a simple regression, R (Big R) is just the correlation coefficient, little r squared. R-squared or fraction of variance explained measures how closely two variables are associated. RSS is the error after optimization with the least squares method. This statistic measures, how much was reduced the total sum of squares (TSS-RSS) relative to itself (TSS). So this is the fraction of variance explained. , where r is the correlation coefficient between X and Y. The higher the correlation, the more that we'll explain the variance. means that the variance was reduced by 51%. indicates a fairly strong relationship between X and Y.